"The Author noting down the narratives..."
click image for close-up Click here for the text of this historical document. Early in the nineteenth century, Philadelphia physician Jesse Torrey compiled a broad range of interviews, narratives and his own first-hand observations into an illustrated volume appropriately entitled, A Portraiture of Domestic Slavery in the United States, published in Philadelphia in 1817. Torrey's book contained several engravings related to slave kidnappings, a profitable underground industry that thrived during the period. Free blacks were especially vulnerable to kidnappers, who would sell them into slavery using forged documents. 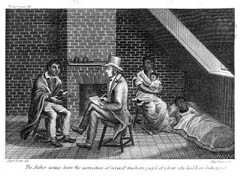 "The Author noting down the narratives of several free born people of colour who had been kidnapped" depicts Torrey sitting in a cabin, writing on a pad in his lap as a black man talks to him and a woman with a baby in her arms looks on.